Vietnamese food has always had a cult following, especially for Americans. And much of that has to do with the large influx of Vietnamese settlers who came to the bustling cities of NYC, San Francisco and LA to introduce us to their beloved cuisine, like slurpable pho and spicy bahn mi sandwiches. Although the food in the U.S. is good, it’s incomparable to the bites you’ll experience as you wander through the cosmopolitan streets of Saigon, or Ho Chi Minh City, Vietnam’s business capital. You’ll find the normal suspects: piping hot noodle bowls pungent with slowly simmered broth and vibrant peppers and stir-fried chicken served with a side of spring rolls. Although these are a must, there’s a million and one other things you have to devour when visiting. From bun reui, a crab based soup with soft dumplings and and tomatoes to banh tam bi, a succulent noodle dish bathed in coconut milk and topped with chicken and pork, there is an endless array of mouthwatering dishes awaiting your exploration in Saigon. Vietnam is, undoubtedly, the land of noodle bowls and a walk through any of Saigon’s open air food markets will prove this. Vendor after vendor can be found selling luscious noodle bowls any time of day. 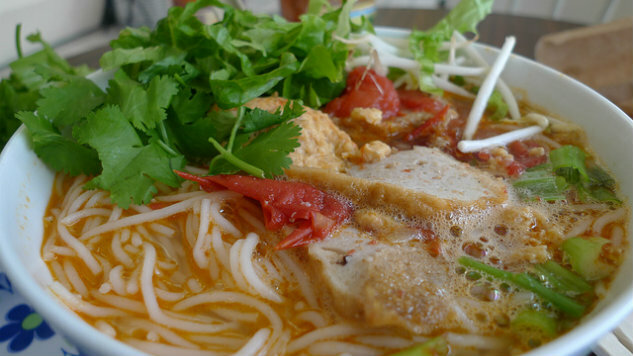 One of the most popular noodle bowls for locals isn’t pho but bun rieu, a spicy and sour stew made with fresh tomatoes, crab base stock, rice vinegar and large rice noodles. The soup is scooped from a giant, simmering base and then topped with hearty chunks of pork, congealed pigs blood (which adds a mouthwatering minerality), slabs of rich crab paste, fried tofu, chili sauce and an assortment of shredded vegetables (like carrots, banana flower and bean sprouts) and a topping of fresh cilantro. If you think the noodle bowls are insatiable, you haven’t had the Banh Tam Bi from Banh Tam Bi Dong Thap (352 Nguyen Trai, 8, Quan 5). This lunchtime staple is served with a layer of thick rice and tapioca noodles (that are a little larger than spaghetti noodles) then topped with shredded cucumber, fresh mint, sweet basil, coriander (or cilantro), thinly sliced pork, fried pork skin and then garnished with a homemade carrot and pickle dashi. That’s not it, though — once the dish is assembled, a giant deluge of creamy coconut gravy is poured all over. For a hint of spice, some locals add a dash of scallion oil or chili paste, but the dish is the perfect blend of sweet, savory and creamy without it. Literally translated as “salad rolls” in English, Goi Cuon is not to be confused with a typical spring roll. Unlike spring rolls, which are deep fried, Goi Cuon are served raw and fresh. Each roll is made with translucent rice paper and then are stuffed with a healthy assortment of fresh greens (like shredded cucumbers, carrots and peppers), cooked shrimp and pork, cooked rice noodles and hearty servings of Vietnamese coriander (or cilantro). Although the rolls are healthy and light on their own, they’re best enjoyed with a big bowl of hoisin peanut sauce and sliced Vietnamese chilies. Just about any restaurant in the city will serve these, but the best variety and freshest rolls we found were deep inside the bustling Benthanh Street Food Market (26 – 28 – 30 Thu Khoa Huan Street, Ben Thanh Ward, District 1). One of the cheapest (and most delicious) street food items found on the streets of Saigon (most notably Ton Duc Thang Road) is Thit bo nuong la lot, or bo la lot (which is far easier for foreigners to pronounce). This savory roll is made from another Vietnamese staple, the betel leaf. However, unlike the variety that’s stuffed with tobacco and chewed, this variety is far better for you and is stuffed, instead, with a succulent mix of beef and pork, chopped lemongrass, Chinese five-spice powder, oyster sauce, garlic, soy sauce and a dash of salt and pepper. Each roll is then grilled over an open charcoal flame, giving every bite just the right hint of smoke. The rolls are then finished off with a drizzle of chili sauce, sliced green onions and chopped peanuts. A serving of these can be found for as little as $1, so it’s a satisfying meal that won’t set you back. Nearly every culture in the world has their own version of Com Tam Suon, or a true peasant’s dish. One of the most famous Saigon dishes, this filling plate has a very unassuming origin. Since most of the early rice farmers were very poor and couldn’t waste any of their product, they’d cook the broken rice that couldn’t be sold (or the gao tam) and pair it with eggs, pork chops, meatloaf and an assortment of vegetables. Even though farmers still enjoy this, you’ll find just about any kind of person ordering this dish for breakfast or lunch, from visitors to wealthy businessmen. You’ll be able to smell the dish being made from miles away (thanks to the piping hot grills situated all over the city grilling thick slabs of pork chops), Com Tam Ba Ghien (84 Dang Van Ngu, phuong 10, Phu Nhuan) is both a local and chef favorite. One of the most mouthwatering dishes on this list isn’t a noodle bowl, hearty rice dish or slab of meat — it’s Rau Muong. Known as water spinach or morning glory, this vegetable grows like a weed and is served alongside almost every entrée in the city. The greens are served a myriad of ways, from stewed to grilled to even fried, but the best way is also the simplest: stir-fried with a bounty of garlic cloves and preserved bean curd. You can also ask for this vegetable fresh to top your bowls of pho. Bite size little rice pillows of heaven, banh khot are the Vietnamese equivalent of potato chips in the fact you can never eat just one. These little puck-shaped delicacies are made from a mix of rice flower, coconut milk and a hint of turmeric powder. Then, they’re fried in a very hot griddle and while they sizzle, a small shrimp is placed in the center. Then, they’re topped with freshly chopped vegetables, herbs and chilies and are drizzled with a spoonful of fish sauce. Banh xeo is the cousin of Banh Knot and more resembles a crepe. Like the banh mi sandwiches, this crepe (which is made from rice flour) is fried in oil and then filled with melt-in-your-mouth chunks of pork belly, shrimp, scallions, lettuce, coriander, shrimp, bean sprouts, mustard leaves and lots of chili and fish sauce. The most famous place to enjoy this staple is at Banh Xeo 46A, which is where Anthony Bourdain frequented during his trip to Saigon. Their crepe is served inside a large and fresh lettuce leaf for an added crunch. A satisfying blend of rice vermicelli noodles, grilled (and oh-so-succulent) boneless pork, a crispy spring roll fried and stuff with pork (which where the dish gets the cha gio part of the name) and a heaping topping of fresh lettuce, chilies and herbs. In addition to pork, some vendors top this hearty dish with fresh prawns, bean sprouts and pickled carrots, as well as chopped peanuts for a bit of crunch. Before you dive in, make sure to add a deluge of sweet chili fish sauce and mix it up. You’ll find varieties of this dish all over the country, but the Southern version (or the one you’ll find in Saigon) is presented cleanly (with the meat on one side, the noodles and vegetables on the other), leaving it up to you to mix everything in. Many also add fresh cucumbers, which are another Southern ingredient.